On August 21, 2013, Sean Boushie signed a sworn affidavit before a notary, and he swore that Bill Windsor was mentally imbalanced, and he no longer felt safe at work or at home. The false sworn affidavit was used to get William M. Windsor arrested and jailed for 134 days. CRIMINAL CHARGE AGAINST SEAN BOUSHIE: On August 21, 2013, Sean Boushie signed a sworn affidavit before a notary public as part of his Petition for Temporary Order of Protection. In the sworn affidavit, he stated that Bill Windsor's mental capacity was compromised and that he was afraid. Bill Windsor is as sane as one can be. Certified, too! 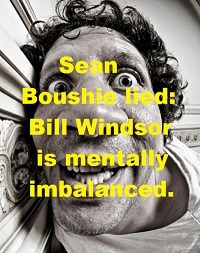 Bill Windsor has never met Sean B**shie or been in his presence. He has never called him or spoken on the phone to him. His videos do not convey any form of craziness whatsoever. His websites simply convey what he believes to be the truth. 1. Ask Sean B**shie for evidence of mental instability. There is none.